The wireframe stage was most important as it allowed us as a group, to streamline our ideas, and get feedback on the designs we had created. The idea was that we would be able to create four wireframes each to begin with, two different designs for both desktop and mobile. We would then bring in both and discuss the benefits of each and the reasons for choosing certain elements of the wireframe. This was a good process as it then allowed us to com back with a better wireframe that combined the best parts of the first two. Once we were at this stage, we combined both mine and Aidan together to create wireframe that had the best parts of the previous wireframes. Since there were three completely separate stages within the design process of the wire framing it meant we were able to smoothen out any flaws within the design. Below you will see the process between the different wireframes. As you can see the wireframes began with a very simple design, something worth noting from the offset is the way both of the designs contain an overlay on top of the welcome image. Aidan’s was the logo, mine was the greeting message, this is something we decided from the beginning that we should keep for the final version, and you can see in the final design that the images have an overlay that is specific to their state. Aidan and I had a similar idea when it came to the categories page, and how to present the different ones. Mine consisted of segments with images inside that represented the category while Aidan had a blank page which held icons for each category. This is again something we combined, so that the background image changed to something that related to the category when you hovered over the icon. A holster is a holder for a firearm that can be worn on the body. The firearms industry is worth a massive $31.8 billion, so there is a lot of money to be made in producing holsters. 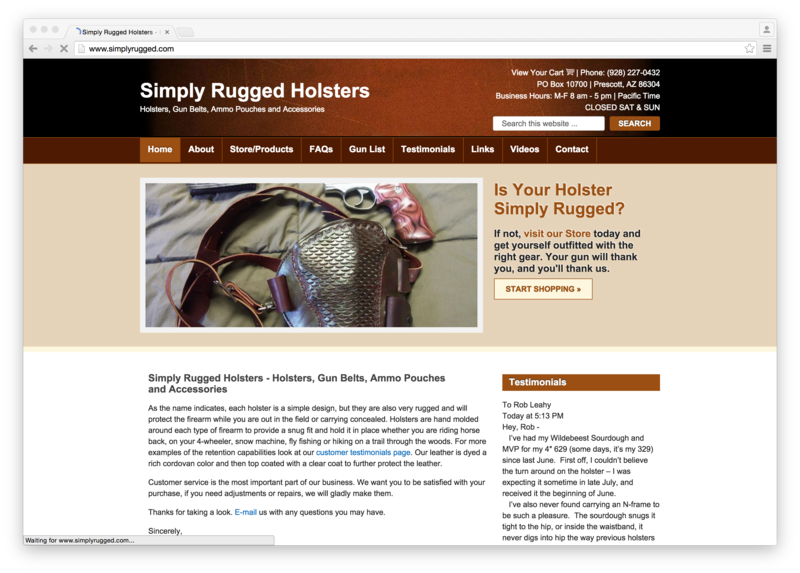 There are different types of holsters, all having different purposes and functions. Concealment holsters are for the use of the general public who feel the need to carry guns on the street with them. 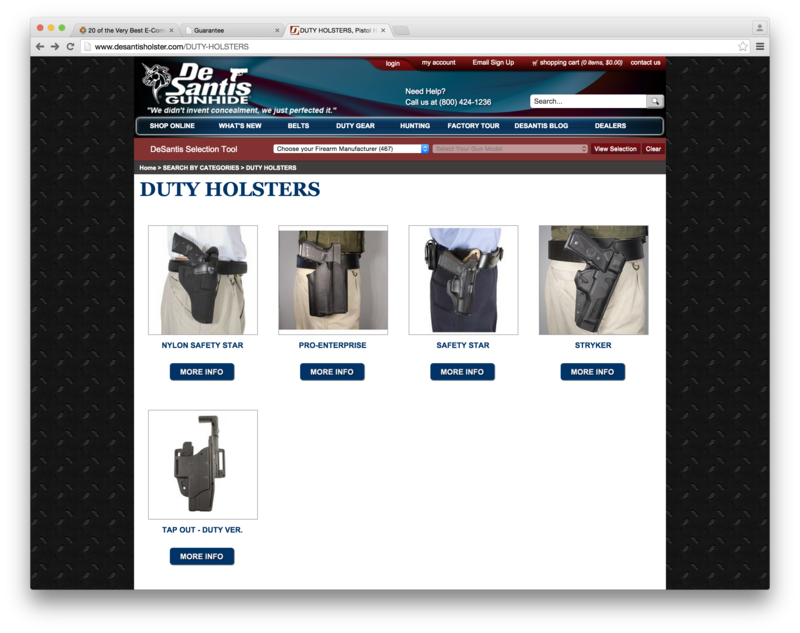 Duty holsters are the same as the ones used by police officers and personal securities. 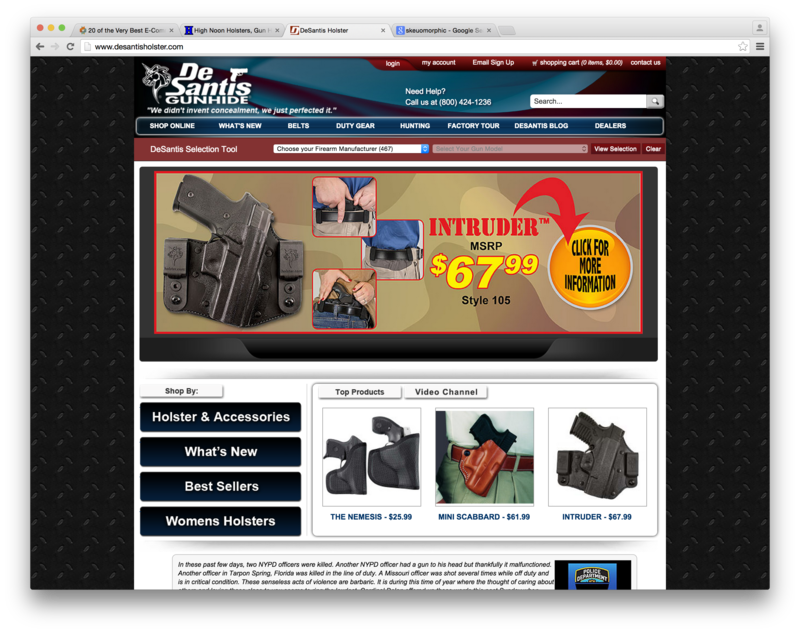 Tactical holsters are mainly for heavy duty use by the military, and personal security forces. Sporting holsters are used to hold hunting guns. It is difficult to break down how popular each type is as records only roughly estimate the sector as a whole. Materials are also worth looking at, leather is a popular and classic option, while it is liable to wear and tear and has been outdated by thermolaminates which are much better because they maintain their shape and avoid scuffs, unlike leather. Other materials listed are nylon and polyester. It seems a little bit too subtle, especially when stereotypes of americans are loud and brash, the flag should be bigger, much bigger and in your face to encourage the patriotic emotions when flying their flag. 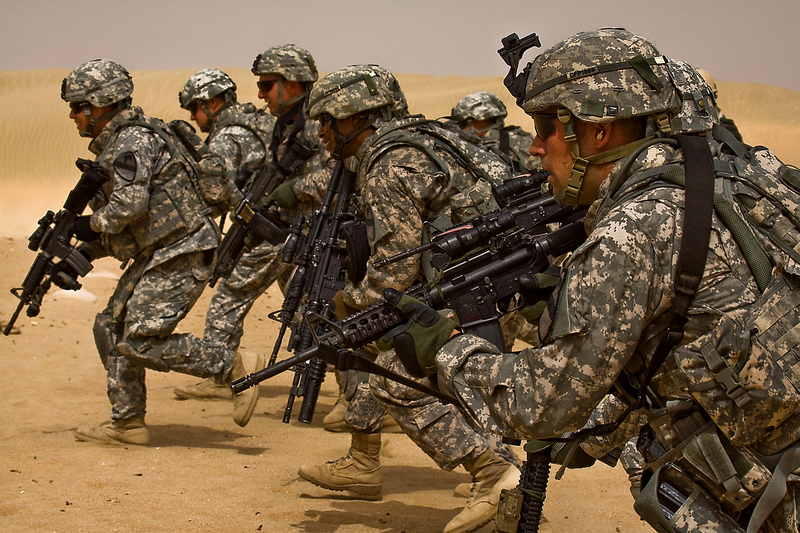 Joining or supporting the military is a very patriotic thing to do in america, regardless of the purpose of the wars they are fighting the vast majority of americans hold their soldiers in high priority. 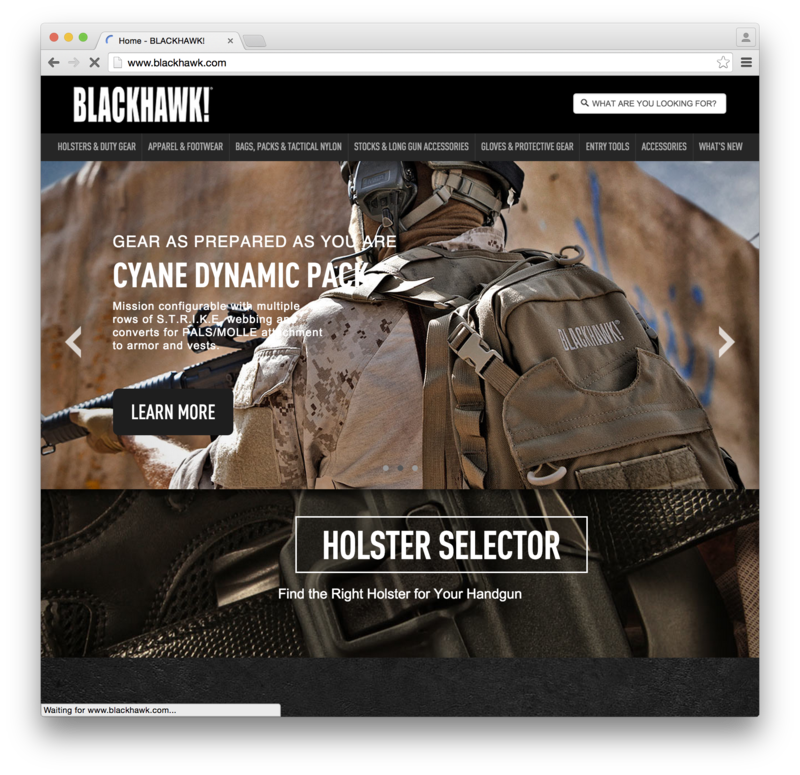 This is fitting given that the sites purpose is to sell gun holsters, this is something that the military use on a daily basis. 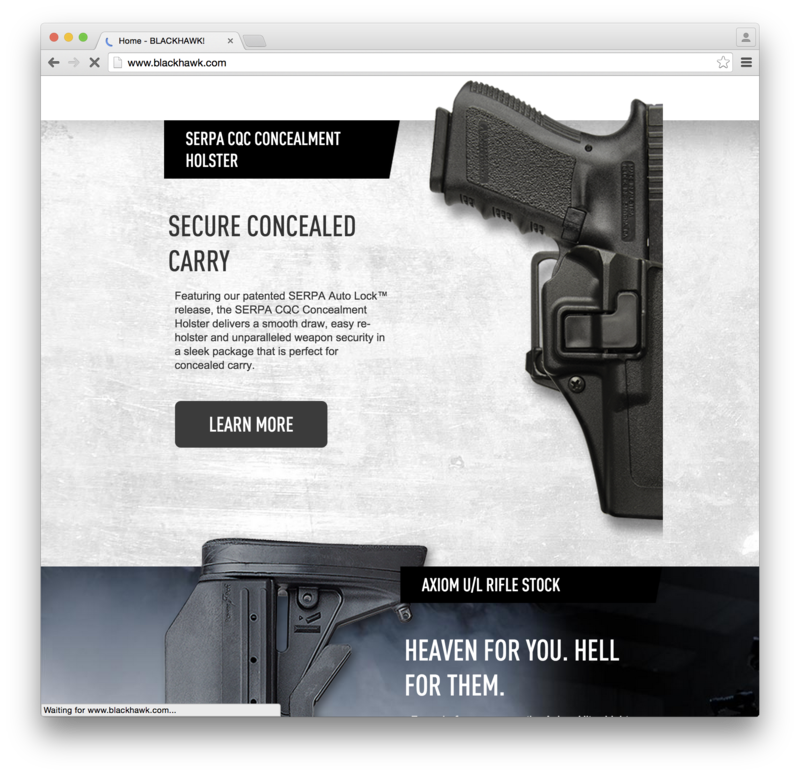 So by making a strong connection between the holsters and the soldiers who serve the country, the american viewing the page would be sub consciously encouraged to buy the product. 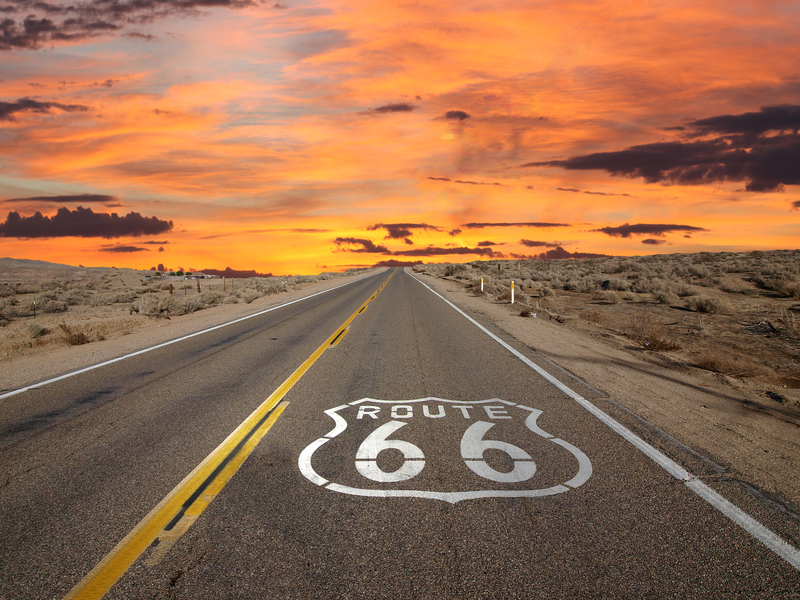 A road trip across America is seen as a great way to be patriotic, when the country is so big, why travel elsewhere? Stay in the country and spend your hard earned money in the us, improving the economy. To best create a design for a website that effectively and efficiently pushes sales boundaries, it is vital to understand the target audience. We need the complete story about the demographic to allow us to successfully create a site that they can use and relate to. Another noteworthy fact is the environmental areas of where these gun owners live. Guns seem to be much more common in rural areas than in suburban or even urban areas. But this is also another interesting route to consider the type of sites, each area will have its own personality, therefore it would be wise to consider a slightly different design, or just featured content for rural, suburban and urban areas. 54% of the entire population believe it is necessary to own a gun, but is it really? and why do they feel so compelled to own said guns. There are a lot of people who suggest it is for their own safety within their own homes, against intruders and potentially against the government/police forces (and in an age of NSA spying, corruption in civil forfeiture, racist police and fear mongering using false flags, who can blame them?),. There is also the patriotic americans who want to keep their beloved “Second Amendment” because it is their right to keep the ruling yet, many americans broke and fought for the repeal of the eighteenth amendment, the legalisation of alcohol. Given it is so patriotic to own a gun, it would be wise to consider what other things make americans feel patriotic and linking those with the sale of guns to create a stronger holder over the consumer. It is clear, simple and easy to use, regardless of the fact there is a huge amount of content on there. Patrol Store seems very busy with a lot of content, there are banners advertising products, smaller adverts that link to an external site. There seems to be a lot unnecessary information on this site that will only confuse the user. 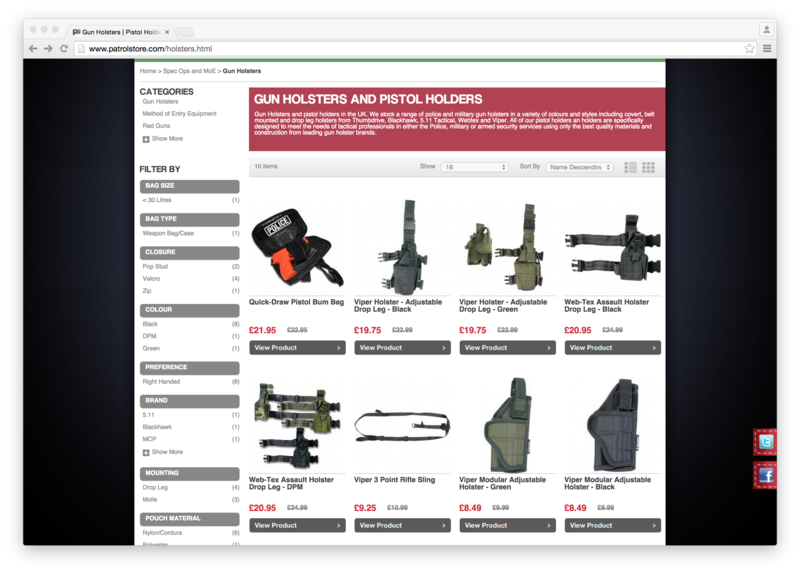 The menu is also confusing, while I was looking for the holster tab I couldn’t seem to find it and if you look as well, you will find it is difficult to navigate. 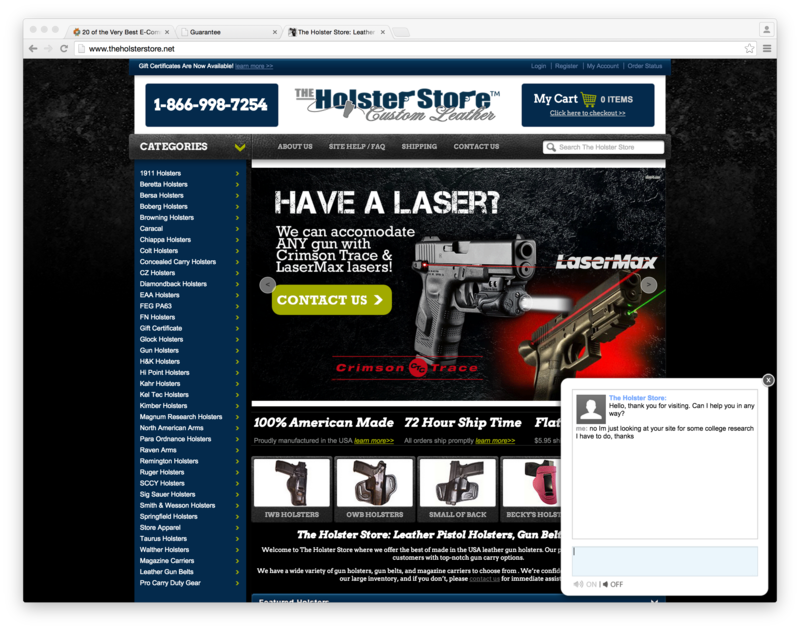 Eventually when I did find the gun holster section there were only 16 to choose from. 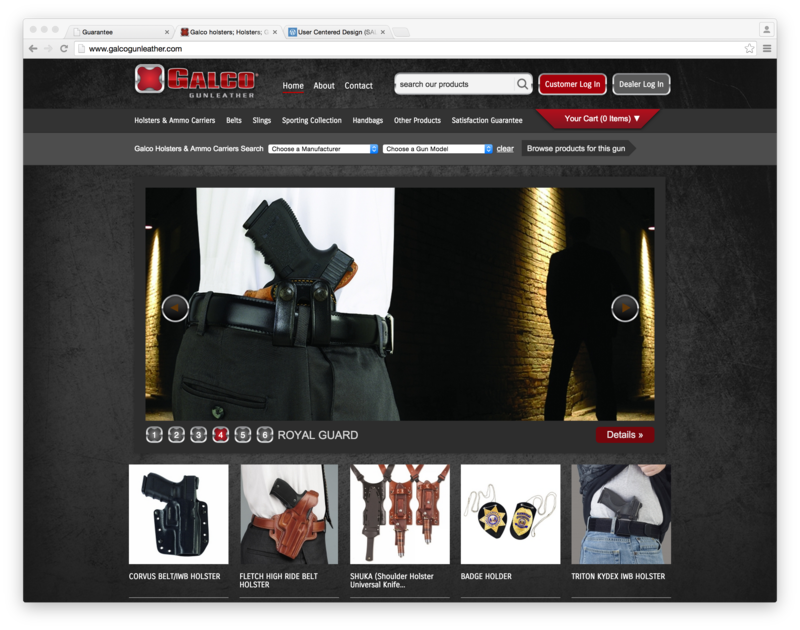 While this limited amount holsters available for sale on the site are shown in a simple grid, they still seem cluttered. Simply Rugged lacks a professional look that allows the user to trust it with its payment details. When you land on the site, you are greeted with plain welcome page that doesn’t particularly make to you want to stay on the site. The store is simple in the sense that the menu makes it easy to choose between the different things you can buy, but at the same time the images are very low quality sometimes with a description. This is awful, and am not encouraged to click on any of the links. From looking though these sites, I have realised something that I hadn’t planned in my planner is e-commerce design, so I am going to make a note to cover that next. Uncle Mike has a great site, it is simple, clean and encouraging to use. It has two colours, grey for the text and green from the logo for the buttons and links. I think the simplicity of the site works in it’s favour. 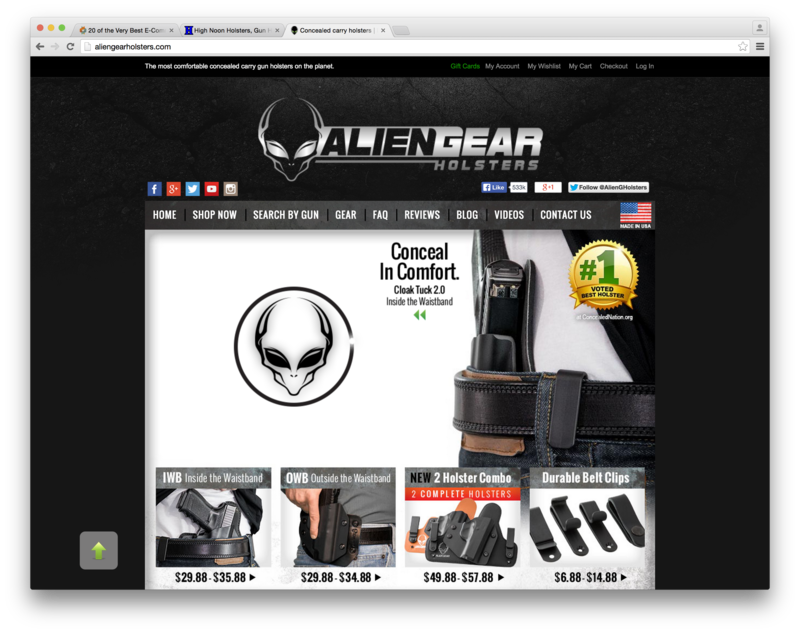 Alien Gear is a very cheese website with alien faces and flying sauces, takes away from the professional purpose of the site, to sell gun holsters. How are the two related? There may be a small demographic of americans who own guns that also believe in aliens, but seems a strange way do business to single out your audience and effectively cut the others out of your business’s target audience. 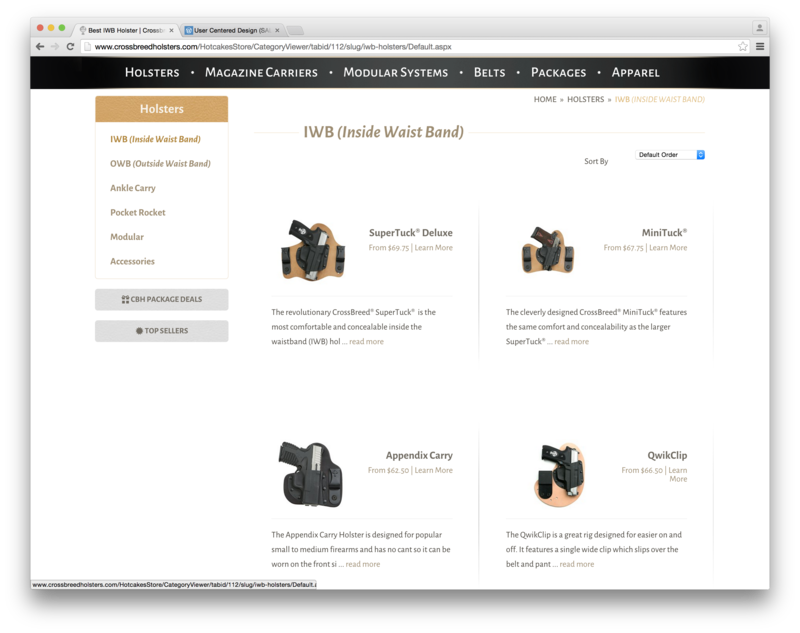 This site has even less options available than Simply Rugged’s with only four holsters available for purchase. De Santus Gunhide seems very outdated by using old skeuomorphic design which takes cues from a real object and makes them into digital design. That said though it also seems to have used the colours of the american flag which helps sell the company as a patriotic experience and will encourage people to buy from the site ‘for their country’. That said, the store is reasonably good, splitting the items into categories then allowing you to go into those categories. 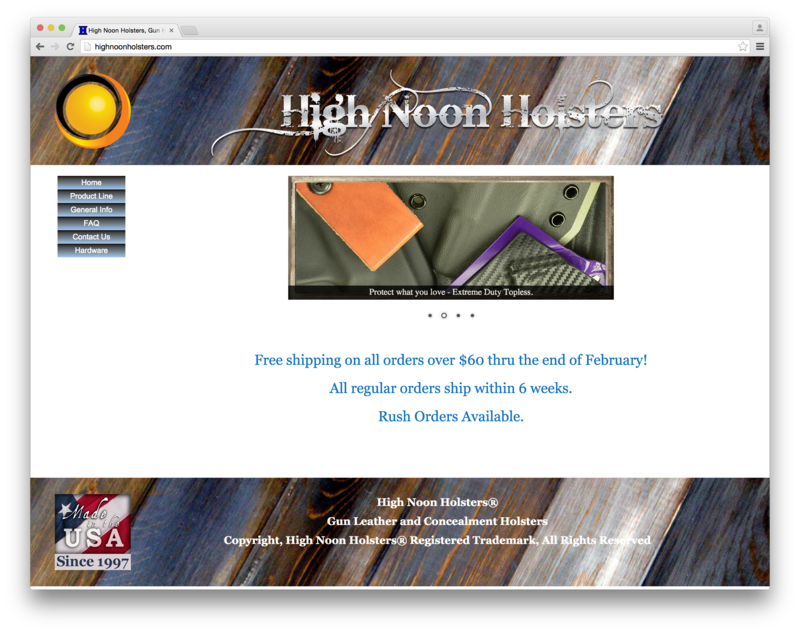 The Holster Store seems very backdated to the early days of the internet with the simple sidebar containing many text links. That said, 30 seconds while writing this past sentence, I received an instant message on the site asking me if I needed any help, just like a shop assistant would if I walked into a store. 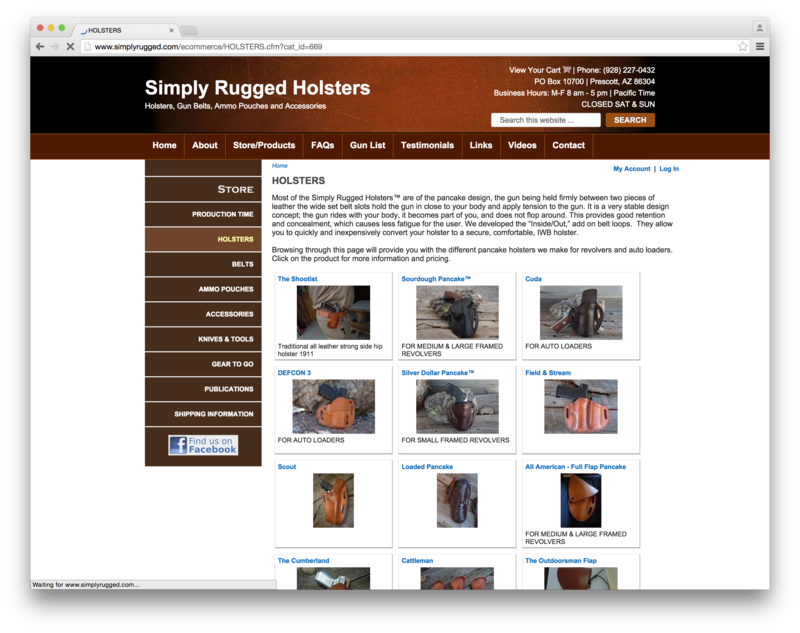 This site has a huge collection of different holsters available for sale. These two facts help make the site better than it originally seemed, customer support is something important that I read in Nathalie Nahai’s “Webs of Influence”. Galco Gun Leather is a website that works really well with flat colour, images and minimal text, the store looks like any other. It is simple and professional enough to be trusted with your money, but nothing special in the sense it doesn’t stand out from the crowd. 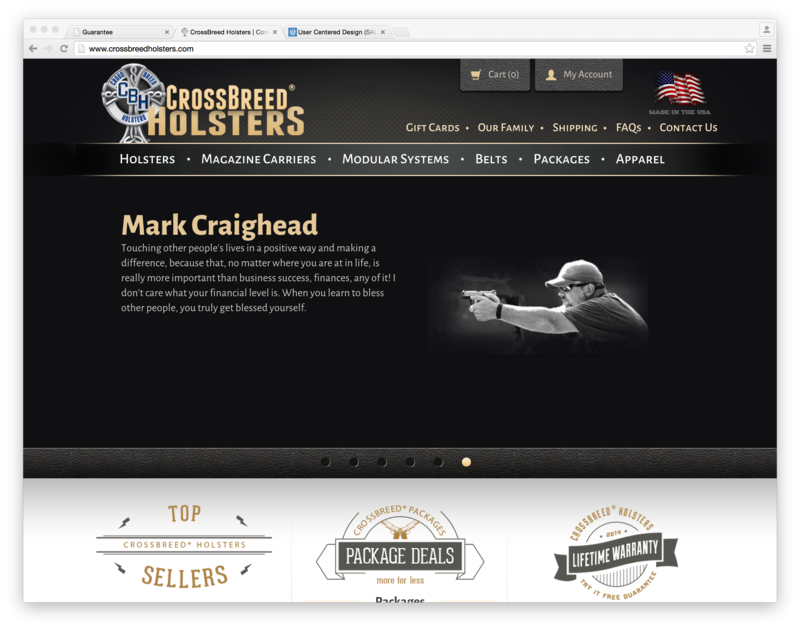 Crossbreed Holsters has a nice mixture of texture and flat colour to look professional, it is accessible and easy to navigate with a well laid out shop, with 60% of the products with discount, this relates to the sales techniques mentioned in Nathalie Nahai’s “Webs of Influence”. 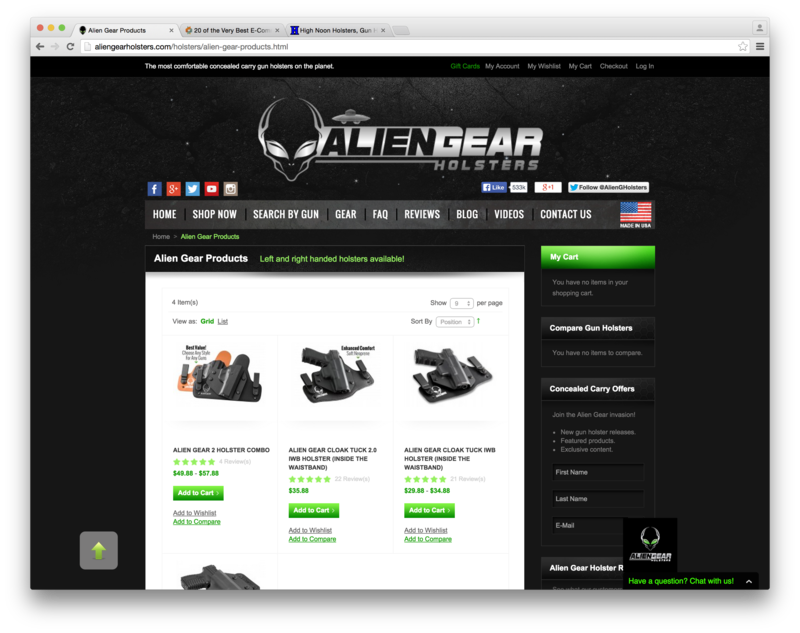 The bright green of sticky holsters instantly makes the site seem unprofessional and unreliable. 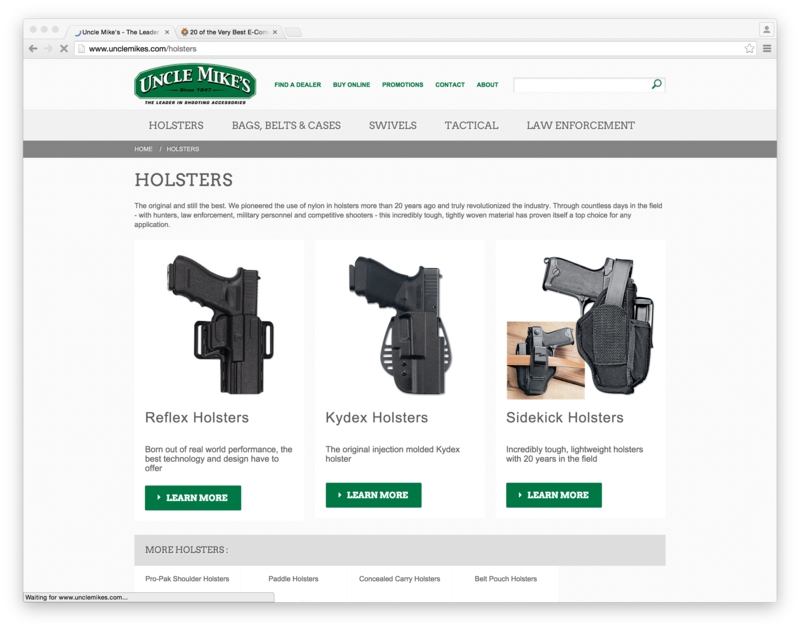 To even browse the holsters you have you used this drop down box to select one you want to look at, this is bad user experience.